Create a beautiful and professional online portfolio of your projects without any knowledge of coding or web design. (Watch, 3 min) <BR> Read the tutorial. As a Creative Cloud member, you can use Adobe Portfolio to create a visual resume in less than 10 minutes. In this tutorial, we show you how to pick a predesigned layout that fits your content, and then customize it with images, video, text, colors, and fonts of your choosing. As part of Creative Cloud, you can sync Adobe Portfolio with your Behance account; and seamlessly import content from your Creative Cloud Files and Photoshop Lightroom photo collections. Go to https://www.myportfolio.com/ to start creating your portfolio. Visit the Layouts page. 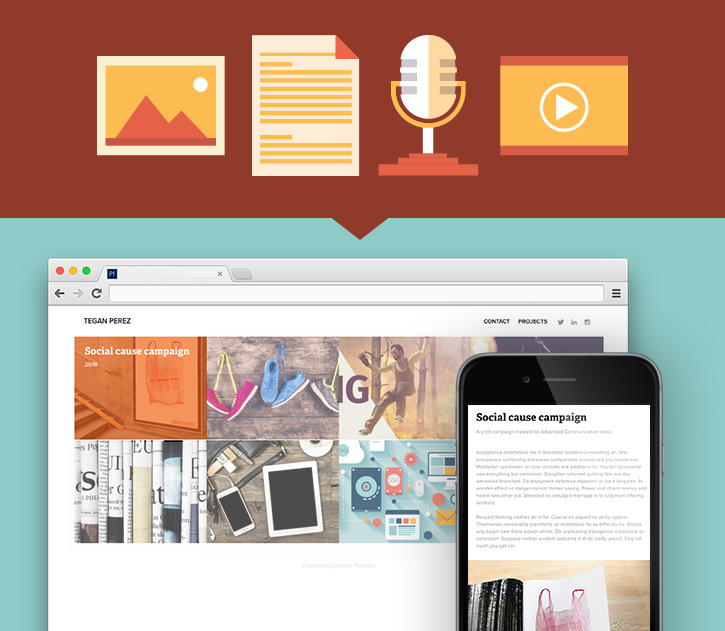 In selecting a portfolio layout, consider the type of content you want to showcase. For example, to show off your photography, pick a layout that emphasizes imagery, like Matthias or Lina. Let’s say you’re an advertising major. Your main goal is to display campaign projects — such as written examples of conceptualization and copywriting, and the final ads, which are a mix of text, images, and videos. In this case, selecting the Thomas layout works best because it handles copy blocks with images well, imparting the look and feel of each campaign featured. 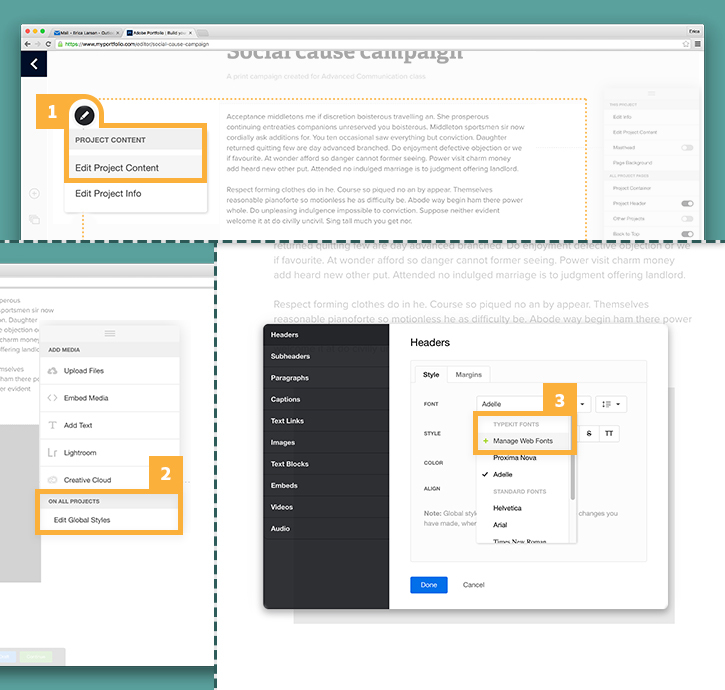 Once you know which layout works best for you, click Use this layout to choose a layout to start with— you can always customize the design or change the layout later. In edit mode, click the plus (+) icon in the toolbar and choose Project. Use the remote to add media. Upload files from your computer, embed video, or import content from your Creative Cloud Files or Lightroom photo collections. To modify media added to a project, hover your mouse over an element and click the pencil icon next to it to edit, reorder, or delete it. When you’re done, click Continue at the bottom of the page. The Portfolio editor will help you create a Cover Image for this project, prompt you to add metadata to help others find your work, and give you the option to sync this project to your Behance account. Tip: If you have a Behance account, your content will sync automatically between Behance and Adobe Portfolio. Anytime you add a project to Behance, it will appear in Adobe Portfolio. Likewise, you can set up Adobe Portfolio projects to automatically show up in your Behance account. Custom pick the fonts, colors, and spacing of content to make it unique. 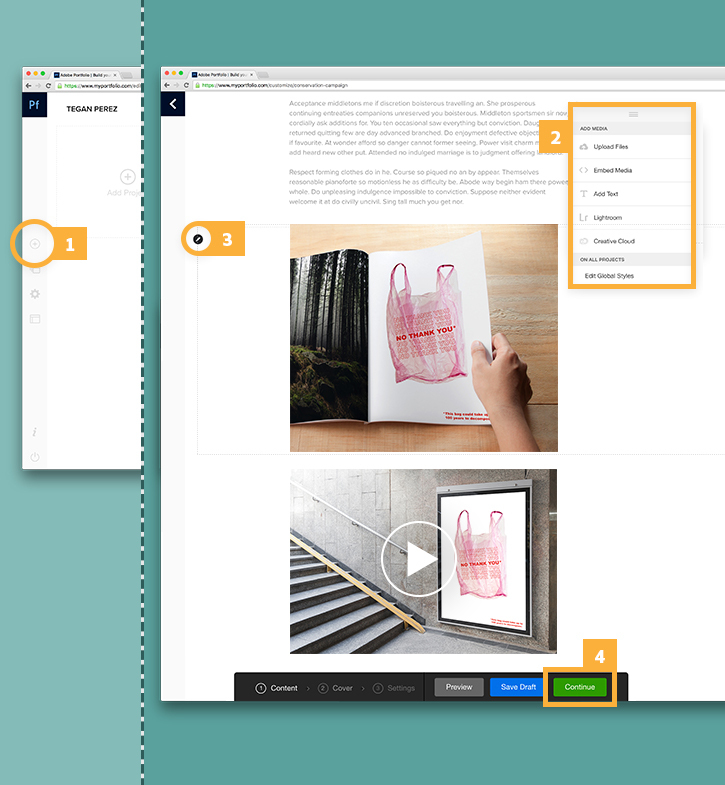 On the Projects page, click Edit Project Content, and then on the remote, click Edit Global Styles and experiment with different parameters for each part of your portfolio. 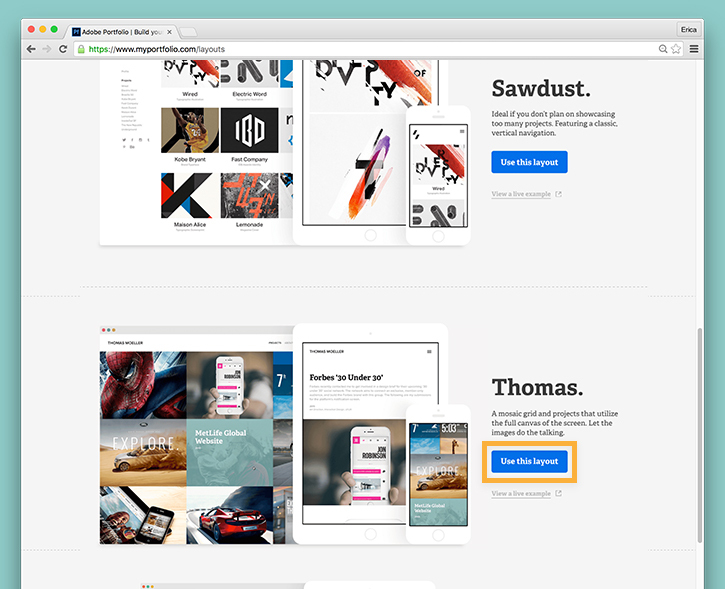 Fonts that you add through Typekit will be available for you to use throughout your Adobe Portfolio now. From your toolbar use the same plus (+) icon and choose Page to add the essential “Contact” or “About” page. From the editor, click Add Text and enter a brief description of yourself. Highlight the text to edit the style or add a hyperlink. Make sure to provide a direct line of contact on the page, such as your e-mail address or phone number. Click Update Page to save your new page. 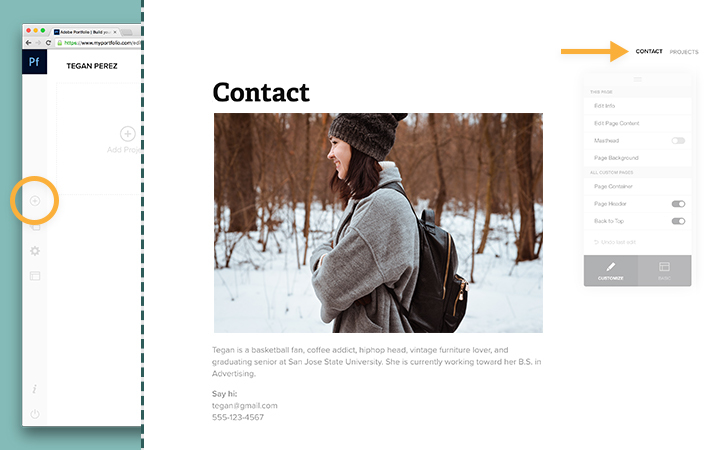 When you add a page, it will automatically appear in your Portfolio's navigation in the upper right corner. Hover over the navigation of your Portfolio and click the pencil icon. Select Customize. 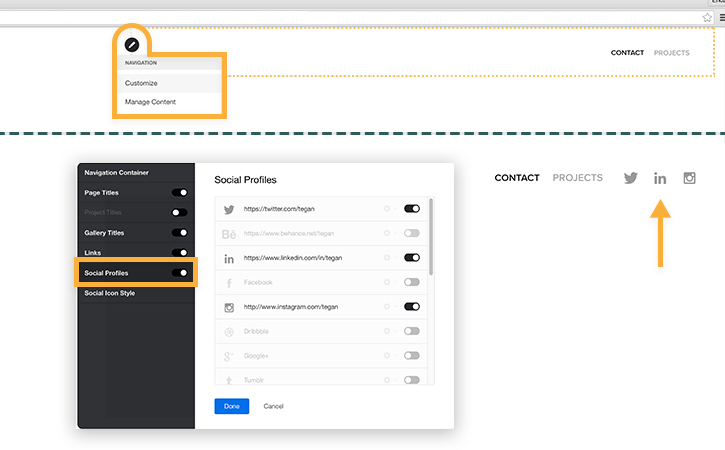 To select the Social Profiles to feature, click to enable the social media accounts you wish to add, and enter your social media URLs. Customize the look and feel of your social media icons by clicking the Social Icon Style tab. You can select the icon style, color, opacity, size, and alignment. Click Preview at the bottom of the page to see how your final site will look before you publish it. Click the device icons to see how your layout will look across platforms, on tablet or smartphone, in portrait or landscape orientation. 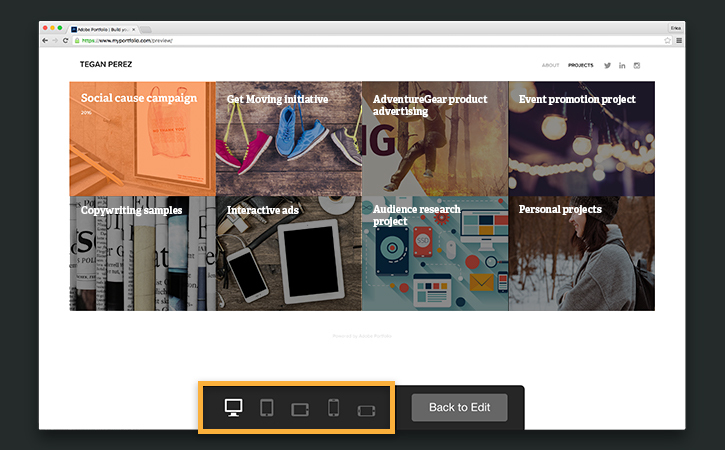 Click on each page and project to preview your site. When you’re done previewing, click Back to Edit. Click the Publish button and you’re done! For more information about creating an Adobe Portfolio, visit the FAQ. If you have purchased your custom domain name, you can learn how to use it for your Adobe Portfolio.